Defence military aircrafts maintenance, Repair and overhaul is an essential component to ensure that the military aircrafts fleets are airworthy, safe, and extend life of the fleets. In military aircrafts maintenance, Repair and overhaul activities performed are repairs, inspections, routine checks and overhaul of the aircraft. The defence military aircrafts maintenance, Repair and overhaul market is influenced by global fleet size, air traffic volumes, and aircraft utilisation. 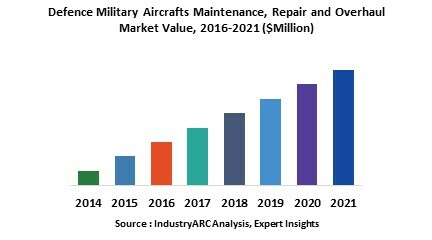 Globally, aircraft maintenance being outsourced, rise in the production of aircrafts, increasing in complex components in aircrafts, and conflicts in Asia Pacific and Middle East are the prime growth drivers of global defence military aircrafts maintenance, Repair and overhaul market. In addition, emerging economies such as China, India and others will create new opportunities for global defence military aircrafts maintenance, Repair and overhaul market. However, higher cost of the replacement is the key restraints for global defence military aircrafts maintenance, Repair and overhaul market. This report identifies the global defence military aircrafts maintenance, Repair and overhaul market size in for the year 2014-2016, and forecast of the same for year 2021. It also highlights the potential growth opportunities in the coming years, while also reviewing the market drivers, restraints, growth indicators, challenges, market dynamics, competitive landscape, and other key aspects with respect to global defence military aircrafts maintenance, Repair and overhaul market. Geographically North America dominated global defence military aircrafts maintenance, Repair and overhaul market, and Asia Pacific is projected to have fastest growth, owing to rapidly increasing military aircrafts fleets and conflicts in this region.